Sabaidee and welcome to Hotel Chanthapanya, Vientiane, Laos. From the front door, through the lobby, in the dining room and in every guest room, three words describe our Hotel exquisite, exclusive and excellence. Entering the hotel lobby, guests will be greeted by exquisitely carved timber furniture exclusive to our Hotel that exudes an air of traditional charm and elegance, and provides guests with a homely comfort. On arrival you will be greeted with a smile by our friendly, charming and professional staff. Moving to your room you'll be faced by tastefully and lavishly furnished timber furniture in traditional design. With heavenly comfortable beds into which you'll sink, awaking recharged and re-energized for your next day in Vientiane. 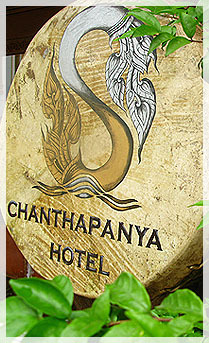 Copyright © 2006-2018 Chanthapanya Hotel, All Rights Reserved.